Curb appeal can make or break a home sale. If people drive up to your house and don’t find it attractive, they’re not going to come inside for the open house. They will not care if you have a brand new bathroom or if you just had the hardwood floors refinished, because they’ll never get that far. Think of curb appeal as the hook that draws people in and increases the value of your home. With the 10 best exterior home improvement ideas, you can transform the outside of your house and get it ready to sell. 1. A roof with slate asphalt shingles. One of the most attractive ways to redo your roof is to install slate asphalt shingles that curve down around the edge of the roof shingle. This makes the home stand out on the block and it gives it a charming appearance from the road. Expect the prices for labor and install to range from: 4.75 to 7.00 per square foot. 2. 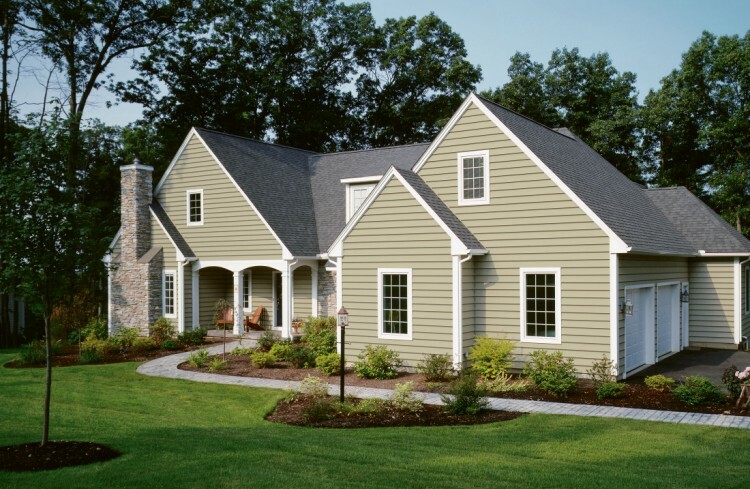 Siding that offers lasting durability. If the siding needs to be replaced, consider using cement board siding. It requires almost no maintenance, comes in many different colors, and lasts far longer than almost any other material. Prices range from 4.50 – 5.50 per square foot for both labor and installation. 3. A beautiful new deck. One of the big things that home buyers love to see is a new deck. They immediately start thinking about having barbecues, sitting on the porch and playing cards with their friends, or watching the children play in the yard. When they are thinking like that, they are thinking about the joy of owning your house, so a deck makes them want to move in. Prices to build a deck from either wood or composite, can run between 10.00 -40.00 per square ft.
Not only do these windows make the home look like it was well-maintained, but they also offer buyers a home that will not cost as much in monthly utilities for heating and cooling. One great manufacturer of windows is: Atrium windows. Atrium replacement windows are built with peace of mind and great warranties. With their solid line up of Double, Single, bay and bow windows, makes this one-overall window company to buy from. They also carry Fiberglass, VInyl, and Aluminum clad windows. Best of all, you can also chose between krypton, and Argon gas. What are these? Both gasses help reduce the amount of heat/cooling loss transfer between window panes. Nothing changes the outside of a home so drastically as a fresh coat of paint. Remember not to start painting with a color that is too polarizing, or you could push buyers away, but choose something that stands out. The paint makes the house look far newer than it actually is. 6. Adding flowers for color and style. There are many things that you can do when it comes to landscaping, but even just a few flowers around the patio can add a ton of color. They also make the house look alive and inviting. Similarly, you may want to think of putting in a brick patio on the front of the house. This sets it apart and shows people that they have other outdoor living areas that will help them get to know the neighbors and enjoy the weather. Nothing can be worse than to have an old worn out garage door. Whether it has bad springs, tracks, or a weak motor. With some many affordable options on the market, there’s really no excuse not to include this into your list of projects. Standard garage door sizes range in the cost of 700 -1,500.00 – Please note: First consult with a professional garage door installer before attempting to replace the garage door yourself. There’s an incredible amount of force and tension on the springs, that if removed incorrectly, can snap back and seriously injure you. Garage contractor charge anywhere between 800-1,600.00 to do the garage door installation. If you want to add charm to the home’s appearance, consider putting shutters on the windows. They do not have to be functional, but they give the house an old-world appearance and they add a bit more color. 10. Putting in an outdoor fireplace. One thing that is sure to blow buyers away is an outdoor fireplace. You can build this in connection with a patio or a deck. It makes the outdoor space look fancy and very functional, which, like a deck, can cause people to start daydreaming about living in your home. 11. Power washing the stones or bricks. Finally, the last of the 7 best exterior home improvement ideas is simply to power wash stones or bricks, which cannot be painted over the same way that siding can. Dirt and grime can build up over the years, making the house look old, but spending a day with a power washer can return the bricks to their original color. Prices where pulled from Remodelingexpense.com where you can go and input your zip code and the size of your project into their calculator and receive pretty accurate prices for labor and materials.